One of the most highly-respected märzens available in the world is arriving now. 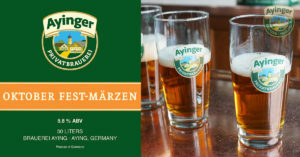 After over two years or negotiation, months and months of waiting in line, Ayinger Oktober Fest-Märzen has finally made it to Thailand this week. Ayinger Oktober Fest-Märzen is full-bodied, rich lager with a malty bouquet and sweetness. Color is deep amber-gold and the flavor is a perfect balance: malt backbone with depth & spiced with enough to make it well-balanced; complemented by perfect conditioning from long maturation; and alcohol of 5.8% by volume.